As all commercial agents know, one of the first things you need to look into are the terms of the current tenant’s leases. Make sure you have been sent full documentation of all of the leases including “side letters” or “Schedules of Condition” which may be attached to the leases as this could diminish their liability on keeping the premises in good repair and condition or may limit their responsibility in contributing financially in any future works that are undertaken. When checking any leases, check the expiry dates and any break options (whether landlord or tenant), ensure these dates and terms have been adhered to. Commercial Investment Property in London can be marketed in various ways. Some properties will be put to the “open market” and have no time scale for submitting an offer. Others will have a “deadline date” where all offers must be made by a certain time/date and will be either by “Informal Tender” or “Sealed Bids”, Davis Brown will be happy to help. Offers must be made in writing. Advise the estate agent if there are any conditions to your offer (i.e. your offer is unconditional, subject to any lease renewals or submitted subject to survey). Supply proof of funding to the vendor together with your solicitor details and a realistic time scale when you can exchange and complete on the purchase. On some purchases, the vendor may have set the exchange and completion dates, check with your solicitor that you can meet with this time scale. Try to supply as much information as possible to the vendor supporting your offer. As commercial agents based in W1, Davis Brown can guide you through this process. Once your offer has been accepted, the vendor or their agent will send Heads of Terms out to all relevant parties, including your solicitor. Once these have been agreed and solicitors instructed, make sure the property is then put “Under Offer” and ask for the property to be taken off the market and no further viewings will take place. The vendor’s solicitors will then send a “legal pack” to your solicitor, which will include a draft contract and Report on Title. This will then allow your solicitor to apply for local searches and raise any enquiries with the vendor’s solicitor. An exchange of contracts happen when both parties have agreed and signed the contract and the deposit monies have been transferred to the vendor’s solicitors (this is normally 10% of the purchase price). As a general guide, allow 4 weeks from receipt of all legal documentation to your solicitor and exchange of contracts. Check with your solicitor with regard to any insurance that may be required on the property between the exchange and completion date. This is also a good time to look into the management of the tenanted property. At our office in W1, we have a commercial property management team who will be happy to offer their expertise. Completion happens when all remaining monies have been transferred to the vendor’s solicitors. As a general guide, from exchange to completion allow 2 to 6 weeks. Your solicitor will inform you when completion has taken place as it is at this time that the vendor will release the keys to you. Once completed – make sure that you have adequate insurance in place, pay any outstanding Stamp Duty Land Tax (if applicable), and register your ownership with Land Registry. Finally, ensure that any meter readings that you’re responsible for are taken when the keys are handed over to you. Snippets of history from the world’s greatest capital city! You may have noticed during your jaunts around the streets of London that there are little blue plaques affixed to random buildings, and you may have wondered what on earth these might be…well here’s a little explanation for you.. These little round, blue snippets of history – otherwise known as London’s Blue Plaque scheme, was founded in 1886 and is the oldest of its kind in the world. Its popularity here in London has meant that it’s since been imitated in many other countries. It is currently run by the English Heritage who took over the scheme in 1986 from the Greater London Council. 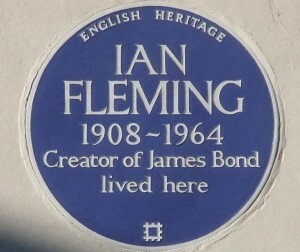 The blue plaque system aims to commemorate the link between famous names of the past – bringing together the human element with the historical environment. Showing where the great and the good have lived, worked and died enriches our knowledge of an area, but perhaps most importantly – it has saved many an historic building from demolition. So whether you’re a tourist or a local – next time you’re out and about in London be sure to look out for these little gems and you might just raise an eyebrow at who might have lived in your favourite part of town! Let’s start in Fitzrovia – Davis Brown Estate Agents has its office based here in the heart of the West End. We have been established since 1901 so we have great knowledge of our surroundings, as well as being part of its history. Fitzrovia was named so by a journalist around 1940, deriving from the Fitzroy Tavern in Charlotte Street. It replaced “North Soho” and covers the area between Oxford Street and Euston Road. Fitzrovia is steeped in history, you’ll notice this by walking the streets close to Davis Brown Estate Agents in Margaret Street – just look up and you will see several blue plaques fixed to the buildings detailing who lived where, and when. No.15 Percy Street was home to Charles Laughton, an actor best known for his portrayal of Captain William Bligh in the film Mutiny on the Bounty. If you head to 29 Fitzroy Square you will find George Bernard Shaw commemorated, the playwright and polemicist lived here in the top two stories with his mother and later on with his wife. The next occupant lived here on a 5 year lease from 1907, she was a leader in the Bloomsbury Set of writers, artists and thinkers – Virginia Stephen, better known by her married name of Virginia Woolf. Other famous names who resided in the area include the Prime Minister – Robert Gascoyne Cecil, Sir Charles Eastlake – the painter and first Director of the National Gallery, Francisco de Miranda, described as the “Precursor of Latin American Independence” and the list goes on! If you want to know where they lived and find out more about the history of the area, then why not visit us at Davis Brown Estate Agents in W1, then take a look around Fitzrovia and find out for yourselves! Stay tuned for the next week’s snippet of history! Considering Purchasing A Commercial Property? Here’s Our Guide! These are again sub-divided but your commercial agent at Davis Brown will be able to advise you on the correct User Clause which is suitable for your requirements. If you decide on purchasing a commercial property you’ll need to consider either Freehold or Leasehold. Freehold is when you purchase the property outright. The owner of a freehold generally owns the land and the buildings/structures on it. Leasehold is when you purchase the property but not the land that the building/structure is on. A leasehold interest can vary from a few years to 999 years. At Davis Brown, W1 can help and advise on the value of a leasehold interest as the lease length will be of significant importance in the value of the property. It is worth speaking to your agent to discuss the lease length in detail as it is sometimes possible to “purchase” a longer leasehold interest from the “head lessee”. Find out when the last works to the property were undertaken; are they overdue? Do all works that have been undertaken meet current Heath and Safety regulations as well as Building Regulations? It may give you some leverage in “chipping” the asking price of the subject property. Commercial Property in London can be marketed in various different ways. Some properties will be put to the “open market” and have no time scale for submitting an offer. Others will have a “deadline date” where all offers must be made by a certain time/date and will either be by “Informal Tender” or “Sealed Bids”, and again Davis Brown Estate Agents will be happy to assist you. All offers must be made in writing. Be clear with regard to any conditions that your offer is subject to (i.e. your offer is unconditional or submitted subject to survey). Supply proof of funding to the vendor together with your solicitor details and a realistic time scale when you can exchange and complete on the purchase. Please note that on some purchases, the vendor may have set the exchange and completion dates. If this is the case, check with your solicitor that you are able to meet with this time scale. Try to supply as much information as possible to the vendor supporting your offer. Once your offer has been accepted, the vendor or their agent will send Heads of Terms out to all relevant parties and their solicitors. Once Heads of Terms have been agreed and solicitors instructed, the property will then be put “Under Offer” and you should ask for the property to be taken off the market and for no further viewings to take place. The vendor’s solicitors will then send a “legal pack” to your solicitor, which will include a draft contract and Report on Title. This will then allow your solicitor to apply for local searches and raise any enquiries with the vendor’s solicitor. An exchange of contracts takes place once both parties have agreed and signed the contract and the deposit monies have been transferred to the vendor’s solicitors (this is normally 10% of the purchase price). As a general guide, allow 4 weeks from receipt of all legal documentation to your solicitor and exchange of contracts. Check with your solicitor with regard to any insurance that may be required on the property between the exchange and completion date. Completion will take place once all remaining monies have been transferred to the vendor’s solicitors. As a general guide, from exchange to completion allow 2 to 6 weeks. Your solicitor will inform you when completion has taken place and it is at this time that the vendor will release the keys to you. When you collect the keys, request that meter readings are taken at this time. Once you have completed, ensure that you have adequate insurance in place, pay any outstanding Stamp Duty Land Tax (if applicable), Register your ownership with Land Registry and finally contact the local authority with regard to any business rates which may be applicable. At Davis Brown Estate Agents, our offices in Fitzrovia are always busy in the summer helping students find the right property. Whether it’s a four bedroom maisonette close to UCL or a stylish studio in Covent Garden we have got it covered. As estate agents in W1, we know how daunting a task finding your first property can be, so we have prepared a short guide to take you from deciding who to live with through to signing the contract. Deciding who you want to live with whilst at university can be tough but it’s vital that you make the right choice. As estate agents in W1, we have seen many friends move in together and it’s a fantastic way to split the bills whilst having fun! It is important though to choose like-minded people – if you are keen to study hard and head for a First, you don’t want to be sharing with the party animal of your year! For those of you that like your own space and are looking for a cosy little flat to work in, go for a studio with stylish storage solutions. Early! Hunting for your first flat is going to be fun, but probably a bit stressful too! As all estate agents in Covent Garden and Fitzrovia will tell you, rental property disappears fast – especially over summer and in the run up to September. Get your exams out of the way and start looking in early July. Register with some local estate agents in W1 and let them know what you are looking for. Keep an eye on websites such as Rigthmove and OnTheMarket as well. That swanky apartment by Fitzroy Place may only be £10 a week over budget, but will all add up! Sit down with your new house mates and work out how much you can afford a month, what your bills will be, and how you want to pay for things. When renting a property, most estate agents will require a copy of your passport, visa if applicable, a proof of current address and university acceptance letter. Get organised and scan this all in so you have copies on your computer and print out a few spares. You may also need a guarantor – make sure you have someone lined up if needs be, and get the same identification for them. If you’re prepared, it will make it much easier to secure a property quickly. You have found lots of suitable properties but now you’ve got to take a look at them. If there are four of you moving in together the likelihood is it’s going to be almost impossible to get you all together at the same time to view all of your options. The best idea is to send whoever is free so that you can view the properties as soon as possible and report back to your friends. As estate agents in W1, we know that rental properties don’t stay on the market for long in summer! You can take lots of videos and photos and discuss as a group and if you like it, you can arrange for all of you to go back together. If you have found the perfect property, get your offer in and transfer your holding fee or deposit. It is a good idea to get these monies available and ready nice and early, so that when you do find your property, you can secure it quickly. As estate agents, Davis Brown have a tenants guide which provides you with information about this process, and it is essential that all of the prospective tenants know their obligations and rights before any money is transferred – pop into our offices in Fitzrovia if you have any questions! Once all of the administrative work is finalised and the agreement has been signed; it’s time to get moved in. Normally, an inventory will take place and it’s a good idea to check through this after the report has been produced, so that you can add any comments. All that’s left to do now is enjoy your property! Davis Brown estate agents recommend that you work out a cleaning schedule amongst yourselves to keep the property in good order, and can recommend a company who works in central areas such as Fitzrovia and Covent Garden. If you would like to find out more about rentals from September or have any questions about the process from offer to let, contact Emma or Sarah-Jane at Davis Brown Estate Agents, Fitzrovia. Commercial Property Agents in London Look Forward! The prime residential market in London is said to have received a major boost as a result of the recent general election result, but is the news as positive for the commercial real estate sector? It seems so, as commercial property agents in London, along with other experts in the field, are confident that continued economic growth, low interest rates, strong employment, booming inward investment and low inflation mark a bright immediate future for the commercial market. This should only add to the success seen in the first quarter of 2015 – the strongest ever over the past 15 years. Quarter one saw investment in the country reach more than £17 billion. Central London saw a turnover of £3.1 billion, a rise of 28 per cent on the previous year, and a little over 60 per cent of this figure came from those classed as non-domestic buyers. The first third of the year saw £5.4 billion of purchases by non-domestic buyers outside London, not counting the billions spent in the capital. Other data just released suggests that the commercial property investment activity in Central London reached a total of £4.26 billion in the first quarter of the year – an impressive start. The £3.4 billion volume figure, meanwhile, was a massive 42 per cent above the average over a five-year period. Volumes in the City were equal to the first quarter of 2014, but volumes in the West End were seven per cent down as a result of a few huge investments in the area last year and some lack of stock. Nevertheless, the start of this year did see three West End transactions involving figures of more than £100 million – compared to zero in the same period last year. Any uncertainty felt before the election is now being pushed aside, leading many commercial property agents in London and beyond to think that the UK’s economic recovery will continue apace, spelling good news for the commercial investment and leasing markets. If this post-election period is making you feel that the time is right to make your next commercial property move, get in contact with commercial property agents in London at Davis Brown today. As Estate Agents in W1, we are often asked by Tenants how they can get back their rental deposit. When you move into a rented property, you can expect to pay between one or two month’s rent as a deposit. This is a large sum of money and we have put together some tips to help make sure you get deposit back at the end of your tenancy. The protection of deposits on an Assured Shorthold Tenancy has greatly improved since 2007 where new legislation came into effect for a Landlord or their agent to place the deposit in a government authorised tenancy deposit scheme. The Landlord or Agent must write to you within 30 days from receiving the deposit to confirm which deposit scheme the deposit has been registered to. If the deposit has not been protected, the Landlord could pay you between one and three times the value of your deposit. At the start of your tenancy, carefully check the agreement before you sign it, ensure you fully understand the terms and what is required from you as a Tenant. Check the deposit clause within the tenancy agreement and identify the Tenancy Deposit Prescribed Information (TDPI) – the Landlord cannot serve a valid Section 21 Notice for possession if the TDPI has not been signed. If you need to make any amendments to agreement during the tenancy, contact your Landlord or Agent immediately. There might be a small charge involved, but it is better than breaking the terms of the agreement and suffering a greater loss later on. It is advisable to have an inventory and schedule of condition prepared at the start of the tenancy. It is therefore important to check you are happy with the contents of the inventory and to note any discrepancies to the Landlord or Agent. Put any correspondence in writing so that you have a paper trail in case there is any dispute at a later date. During your tenancy, inform the Landlord or Agent if any part of the property or its contents becomes broken or damaged. It is better to be upfront if the damage has been caused by you. Trying to repair it could cause more damage and cost you more in the long term. At the end of the tenancy, read through the tenancy agreement and the inventory to remind yourself of your responsibilities. If you are required to have the property professionally cleaned, ask the Landlord or Agent if they have a preferred contact they would like you to use. Keep the receipts as evidence but also make sure the property is cleaned to the standard it was found. The property should be left in the same condition as when you moved in, allowing for ‘fair wear and tear’. What doesn’t count as fair wear and tear? Examples include a build-up of lime-scale in the bathroom, mould that has formed as a result of a room not being ventilated properly and general dirt and grime as these are things that should be maintained during your tenancy. Remove all rubbish and belongings, even if you do not want them (e.g. crockery and cutlery) as you may be charged for removal costs. The inventory and check-in will usually record the meter readings and it is your responsibility to register your name with the utility companies and pay the bills on time and in full up until the end of the tenancy. The Landlord can recover non-payment of utilities from the deposit. At the end of the tenancy, the Landlord or Agent has a certain time period to write to you confirming whether they plan to make any deductions. Make sure they contact you within this time frame. Read through the deposit clauses in your tenancy agreement as the timescales can vary. If you cannot come to an agreement, it is time to refer to the case onto an Independent Case Examiner of the Tenancy Protection Scheme. We hope that most cases won’t have to be referred, however our useful points above provided by our Agent Estates in W1 should give you some guidance for your next property adventure. Contact Davis Brown Estate Agents in the West End for more information. As all estate agents in W1 will tell you, Bayswater is situated within the City of Westminster and lies in the Royal Borough of Kensington and Chelsea. A predominantly residential area, Bayswater sits to the North of Hyde Park and is sandwiched by Marylebone and Notting Hill. As our estate agents know, Bayswater is directly to the West of Fitzrovia and is simply a couple of stops away on the tube. Bayswater was originally owned by the Abbey of Westminster, as detailed in the Book of Domesday. Bayswater today now has the largest number of hotels of any region. It is thought that the term ‘Bayswater’ dates back to 1380 and derives from ‘Bayards’ Watering Place’ which was the name of the stream that flows under Uxbridge Road. Residents of Bayswater are spoilt for choice. As estate agents in Fitzrovia, we always use the large selection of public transport on offer to get about. There are five underground stations in Bayswater: Notting Hill Gate, Royal Oak, Queensway, Lancaster Gate and of course Bayswater. The five stations offer connections via the Circle, District, Central and the Hammersmith and City Line. Residents also benefit from easy access to the nearby Paddington Overground station which has extensive transport links to across the country. Hyde Park has a jam packed calendar of events year round, from concerts to fun runs. There is something for everyone, however for those of you looking for something a little more relaxing, the famous Whiteleys shopping centre is the place to head. Constructed in 1912, the store used to be known as the place one could purchase everything from ‘a pin to an elephant’. Opened in October 2007, Hereford Road (on Hereford Road!) occupies a site that was once a Victorian butcher’s shop. This highly acclaimed restaurant champions British food and is a must for anyone in the area. For those of you on a health kick, try Daylesford Organic Café on Westbourne Grove where the menu is changed seasonally and the focus is on fresh, organic produce. The Swan on Hereford Road is an 18th Century coaching inn, famous for its terrace bar and location (just across the road from Hyde Park!). As estate agents in W1 will know, Bayswater is one of the move diverse areas of London, with an eclectic and extensive range of property on offer. Traditional streets and garden squares are juxtaposed with inter-war, purpose built large apartment blocks. The majority of Bayswater however is made up of Georgian, stucco fronted houses which are either divided up into flats or have retained their original layout. More recent developments also characterise the area, such as the 650 unit Hallfield Estate, designed for the council by Sir Denys Lasdun. The range of properties on offer means the area is a melting pot of culture, wealth and ethnicity – giving Bayswater its reputation of being one of the most cosmopolitan areas in London. For families there are a huge range of good schools on offer, from St James & St John’s Church of England Primary School to the prestigious Westminster Academy Secondary School. Furthermore, the selection of parks available locally makes for an ideal combination of city living with green space. For young professionals Bayswater offers extensive transport links which means easy commutable distance to all parts of London. As all estate agents in W1 will tell you, Bayswater is a fantastic area with so much to offer its residents. From traditional white terraced houses to Whitley’s shopping centre, Bayswater has it all. To find your perfect property in the area, please contact Davis Brown estate agents, Fitzrovia to find out more. Considering a commercial investment in London? Considering becoming a commercial tenant? Davis Brown – a firm of Chartered Surveyors and Estate Agents in Fitzrovia are here to help you with the process. We are regulated by the Royal Institution of Chartered Surveyors so you can take full advantage of our professional expertise. Here’s a guide that we at Davis Brown have put together to help you with the process. These are again sub-divided but your commercial property agent at Davis Brown, Fitzrovia can advise you on the correct User Clause which is suitable for you. Additional Charges (ask if there are any additional charges which may not have been advertised – these will normally include your building insurance contribution and possibly a “sinking fund” contribution). You must submit all offers in writing. You’ll need to provide the landlord or commercial agent with your company accounts (usually the last 3 years). You’ll also need to provide bank details and current landlord details for references (your bank may charge you for this service – £15/£20 per reference). You’ll also need to supply solicitor details to the landlord/estate agent. Try to supply as much information as possible to the landlord/estate agent supporting your offer. Once your offer has been accepted, the landlord or commercial agent will send Heads of Terms out to all relevant parties and their solicitors. This will give an overview of the lease terms and will allow you a final opportunity to negotiate your terms, before draft contracts are sent. Once Heads of Terms have been agreed and solicitors instructed, the property will then be put “Under Offer”, taken off the market and no further viewings will take place. Your solicitor will then amended and/or approve the draft contract that has been sent and any amendments will be made between the solicitors – this can take 6 weeks to complete. During this time, you could visit the premises to take measurements of windows etc for blinds, check the IT/Telecoms supplier (if you have confirmed a “move in date”, you can contact your IT/Telecoms supplier in advance to book an engineer when you move), arrange for quotes for any alarm systems that you wish to install (you’ll need the Landlord’s permission for this) and arrange for floor plans and designs for your required layout. On completion of the lease you will have to pay any rental deposit, rent and service charge (this will normally be 3 months in advance, depending on the quarter day), insurance contribution and any other charges in advance. Once the monies have cleared and the lease has been signed by all parties, you can then arrange with the landlord/agent a suitable time to collect the keys to your new premises. It is also advisable to take meter readings (gas, electric, water) when collecting the keys. Remember to also inform the local authority that you have taken over the lease in relation to your business rates. If your lease has a “break clause” which allows either you or the landlord to terminate the lease before the lease expiry date, make sure you take a note of the date this must be completed by. A break clause will normally require between 6 to 12 months’ notice, so if your break clause is 24th March 2018 with a notice period of 9 months, you must inform the landlord or their representative before 23rd June 2017). Notice must be given in writing. Around 3 months before your lease expiry, the landlord may wish to start marketing the premises for a new tenant. The landlord’s representative will visit the premises at a suitable time and take marketing photos and possibly new measurements. They will need to give you 24hrs notice before any viewings take place and the agent will make sure any disruptions are kept to a minimum. Around 1 or 2 months before you leave the premises; the landlord will send a representative to visit your premises to undertake a “Schedule of Dilapidations”. This will provide you with a step by step guide of all works that must be undertaken, making sure that the premises are left in a good condition. As when you moved in, the landlord or their agent will visit you to take meter readings and to collect all keys. You’ll need to inform your suppliers (gas, electric, water, alarm systems, IT/Telecoms) of your “moving out” date and inform the local authority in relation to your business rates. For more information, please contact Davis Brown – your Estate Agents and Chartered Surveyors based in W1 – who will be happy to help you with every step of the way.